Recipe courtesy of Chef Jamie Leeds of Hanks Oyster Bar in Washington D.C.
For Hollandaise Sauce: Reduce 1/3 cup water, juice, 1/8 teaspoon salt, and 1/8 teaspoon pepper to 2 tablespoons in nonreactive saucepan; remove from heat; cool to room temperature. Whisk egg yolks into the reduction; set over low heat; cook, whisking constantly, until mixture turns into thick, yellow foam; remove from heat. Dribble melted butter into egg mixture, whisking constantly; add remaining 2 tablespoons water before all the butter is incorporated, whisking constantly. Strain through fine chinois; place in Bain Marie; reserve (keep warm). For Hash: Preheat oil in large skillet set over medium-high heat; add onion, pepper, potatoes, cayenne and cumin; cook until tender; remove from heat; add crabmeat; season; mix well; reserve. 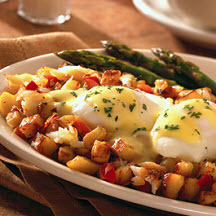 To Serve: Mound hash on each plate; top each mound with 2 poached eggs; drizzle Hollandaise sauce over and around; sprinkle with parsley. Nutritional Information Per Serving (1 recipe): Calories: 140; Total Fat: 1g; Cholesterol: 5mg; Total Carbs: 11g; Protein: 21g; Sodium: 360mg.